Put Maven Black-Briar's competition out of business. Meet Mallus Maccius at The Bannered Mare. Speak to Sabjorn in the Honningbrew Meadery. Engage in some industrial sabotage and witness the mead tasting failure. Acquire the promissory note and return to Maven. As you will be battling Ataxia-bearing skeevers, resist disease or cure disease potions or enchantments are useful. Furthermore, given the vermin's speed, a fast, light melee weapon is advised. Given Hamelyn's magical ability, resist magic, shock, fire, and frost spells or enchantments are useful. Now that you're a full member of the Thieves Guild, you've been told that Maven Black-Briar wants to see you. You are likely to find her on the second floor of The Bee and Barb. After a condescending greeting, Maven will solicit your cooperation in putting her competitor, the Honningbrew Meadery, out of business. She will also ask you to perform some industrial espionage to understand how Honningbrew could have started up their operation and achieved success so quickly. She will direct you to meet Mallus Maccius at The Bannered Mare in Whiterun for further instructions. Mallus will tell you that Sabjorn, Honningbrew's owner, is planning to hold a special tasting for an important personage, and that you must poison the mead for the occasion. He suggests that you approach Sabjorn and offer to help him with a pest infestation, then use the poison he will give you to accomplish the deed. He instructs you to access the mead vats through a tunnel leading there from the meadery's basement. Although he claims you could alternatively pick the lock on the brewery door, you can't, as it requires a key which is only found inside the boilery. His own motives are quite simple: he'll be given control of the meadery from Maven once Sabjorn is out of the way. Sabjorn will quickly accept your offer to help and provide you with the required poison as well as the key to the Meadery. If you successfully persuade him, he'll even give you half your pay upfront (500 gold). That's the only way I operate. (Persuade) Passed: Oh, very well. Here's half. You get the rest when the job's done. You'd better, or I yell "skeever." (Intimidate) Passed: Okay, okay. No need to make rash decisions. Here's half. You get the rest when the job's done. In the basement, you'll easily find the tunnel Maccius pointed as the infestation's source. Fight your way past the tough Venomfang skeevers as well as a few frostbite spiders, taking care to avoid bear traps and tripwire-activated swinging maces along the way. You'll emerge in a large chamber where a mad bandit wizard named Hamelyn is guarded by several vermin. Try to use sneak to avoid fighting them all the same time, as Hamelyn can cast powerful destruction spells and is especially lethal if he catches you in a weakened condition. Poison the skeever nest next to Hamelyn's alchemy lab and don't miss the Sneak skill book Three Thieves lying atop a chest nearby. Press on, avoiding two bear traps, and you'll arrive at the door leading to the boilery. Head up the stairs to a balcony overlooking the room and head towards the lone brewing vat on the far side. Poison it and exit using the Honningbrew Brewhouse key hanging on a hook on the right side of the door. Head back inside the meadery and you'll meet either Commander Caius or Sinmir (if the Stormcloaks have taken Whiterun) tasting the mead. The taster will sense something wrong with the drink and blame it on poor sanitary conditions. For this perceived offense, he will place Mallus Maccius in charge of the meadery and haul Sabjorn to jail at swordpoint. Once Sabjorn has departed, speak to Mallus about gathering business intelligence for Maven and he'll hand over the key to Sabjorn's dresser. Head upstairs and steal the promissory note from the dresser. An expert-locked door nearby will open to reveal a room with some silver ingots, a silver necklace, some coin purses, and the Honningbrew Decanter, a miscellaneous unique item that can be sold to Delvin Mallory for a fair price. Be sure to read the Alchemy skill book A Game at Dinner, which is found on the table closest to the door. Head back to the Bee and Barb in Riften and report your success to Maven, who is frustrated by her inability to identify the note's author. When you point out the author's symbol is the same as that on the bill of sale previously found in the Goldenglow Estate safe she suggests taking it to Brynjolf. Provided you didn't kill anyone but Hamelyn, she will then pay you with a leveled enchanted sword or dagger. Once you're back in the Cistern, Brynjolf will muse that the identical symbol points to someone attempting to drive a wedge between Maven and the guild, and will send you off to Mercer to continue your search. Mallus will now also be available as a fence. With a bounty of at least 1000 gold, the captain of the guard will try to arrest you on sight when you're reporting back to Sabjorn. Remaining out of sight and talking to Sabjorn is virtually impossible, so it's advised to bring the captain to his knees and quickly talk to Sabjorn, then remain undetected until the winetasting scene starts. It is recommended to stay hidden until the captain leaves with Sabjorn. If you break into Honningbrew Meadery before receiving this quest, it will not become available (even after installing the 1.4 patch) at the end of Loud and Clear. If you cannot obtain the quest, you can force it to start using the console with startquest TG03, followed by setstage TG03 10. If you approach the nest in the first person view, the "activate nest" button needed to poison the nest may fail to appear. Changing to the third person view can sometimes resolve this. PC players can advance this manually using the console command setstage TG03 45. After completing the quest Loud and Clear, if you do not ask Brynjolf why Maven Black-Briar is requesting a meeting, the quest will not become available. Also Brynjolf will not speak to you, saying only that he has "important tasks to be doing". If speaking to Maven outside of the Bee and Barb, while she is headed to the inn, she will simply stand in the same spot day and night until the quest is over. Activating this quest but not finishing it before activating Liberation of Skyrim may cause Commander Caius to be present for the tasting instead of Sinmir, where he will fail to drink the mead, causing the quest to stall. You can also transport Sinmir to the Meadery using the console commands prid 813ba and moveto player. If you successfully destroy three beehives and complete the Loud and Clear quest, but go back to Goldenglow Estate and destroy more beehives before you speak to Maven Black-Briar, Maven will speak to you as if you failed the earlier quest. ? 10 I've been sent to speak to Maven Black-Briar, head of the wealthiest most influential family in Riften. According to Brynjolf, she has a job of utmost importance for me and I need to follow her directions to the letter. 20 Maven Black-Briar has sent me to Whiterun where I am to meet with someone named Mallus Maccius. Together, our goal is to bring down one of Maven's competitors, Honningbrew Meadery and discover where he obtained the financing to take her on. 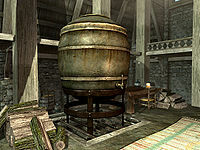 30 I've become a key component in a cunning plan to frame Honningbrew Meadery's owner, Sabjorn, and have him imprisoned. The first part of the scheme is to approach Sabjorn under the guise of assistance with a pest problem he's having thanks to Mallus's tinkering. 80 The plan worked perfectly and Whiterun's Captain of the Guard was stricken with illness when he drank the poisoned mead. Sabjorn's been carted off to jail and Honningbrew Meadery is now closed. 90 Now that Mallus's position as the owner of Honningbrew Meadery has been secured, I need to find any information explaining how Sabjorn was able to fund this costly operation. 200 Finishes quest The information I obtained from Honningbrew Meadery points to the same anonymous buyer of Goldenglow Estate. If successful, this individual would have completely estranged Maven Black-Briar from the Guild and destroyed it economically. It's becoming painfully obvious that it's time to shed some light on our mysterious adversary before they have a chance to strike again. The following empty quest stages were omitted from the table: 0, 45, 55. On the PC, it is possible to use the console to advance through the quest by entering setstage TG03 stage, where stage is the number of the stage you wish to complete. It is not possible to un-complete (i.e. go back) quest stages, but it is possible to clear all stages of the quest using resetquest TG03. This page was last modified on 20 February 2018, at 19:16.